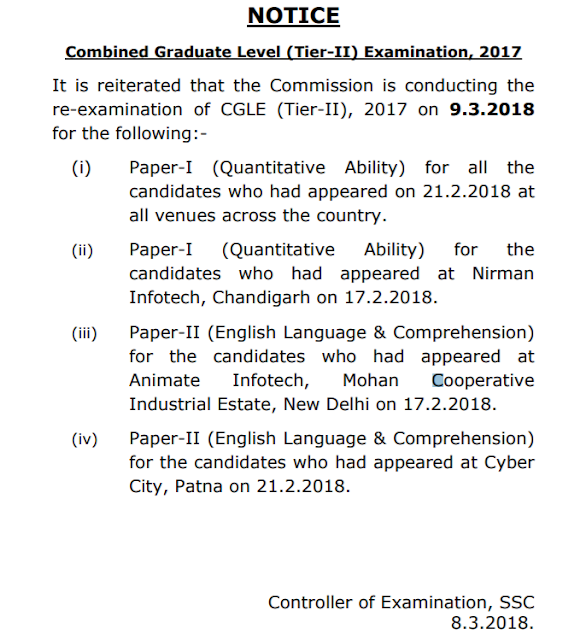 SSC CGL Tier-II 2017 Re-Examination Schedule for 9th March 2018 - Get here complete details of papers, where to conduct for which paper. (i) Paper-I (Quantitative Ability) for all the candidates who had appeared on 21.2.2018 at all venues across the country. (ii) Paper-I (Quantitative Ability) for the candidates who had appeared at Nirman Infotech, Chandigarh on 17.2.2018. (iii) Paper-II (English Language & Comprehension) for the candidates who had appeared at Animate Infotech, Mohan Cooperative Industrial Estate, New Delhi on 17.2.2018. (iv) Paper-II (English Language & Comprehension) for the candidates who had appeared at Cyber City, Patna on 21.2.2018. Controller of Examination, SSC 8.3.2018.